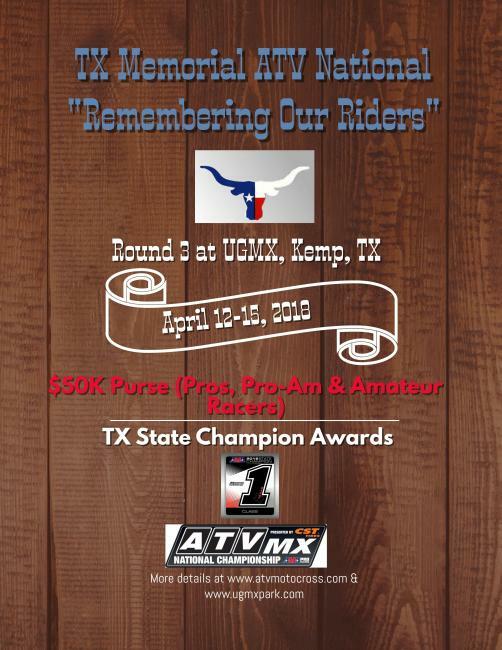 Get ready for ATV Motocross racing at Underground MX on April 14 -15, 2018 in Kemp, Texas! This event will be offering a $50,000 Purse provided by Sponsors, 88 Live to Ride & Ford Brothers Racing! This round is set to be an AMA Texas State Championship round, with #1 plates for all classes at this round! Pre-registration for the Underground ATV National, April 14 & 15 at UGMX is now OPEN...register here! Receive a $10 Rocky Mountain ATV/MC Race Gas certificate for pre-registering! Gates close at midnight each night. Check the full schedule and information here. RV reservations for ATV National are SOLD OUT. This is an AMA sanctioned race event so AMA membership is required. Event only membership will be available at the track. Annual memberships are available here or at the track. Join us Saturday evening 4/15 to enjoy local rock group, Just Us and challenge your riding skills with Buckshot the mechanical Bull!